© 2011 BrianneJoy. All rights reserved. Justin is comin’ to town! And for those who aren’t aware, I consider mine and Justin’s special date (since we do not have an official anniversary) February 15th, the date of our first kiss. Therefore, Valentine’s Day is not the big deal for me, it is the memories of times we’ve shared together. Plus, this year seems even more special than any before. #1 It’s been 3 weeks since we’ve spent a weekend together. #2 This coming up Tuesday will make 4 years we’ve been together. #3 I just down-right miss him. With all of that said, I am so excited to see him. Not because it’s “Valentine’s Day” weekend, but because I will have his company for 2 whole days. 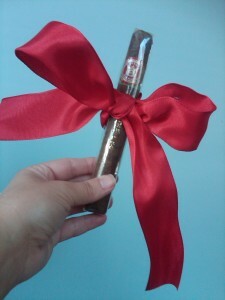 To surprise him, I picked him up a treat (and tied it with a lovely, red ribbon) and I can’t wait to give it to him. Here is a sneak peak, but it’s not complete… The actual gift is to come. 11 Feb ’11 Filed under Our Love Story. Bookmark the permalink. Post a comment. Leave a Trackback (URL).